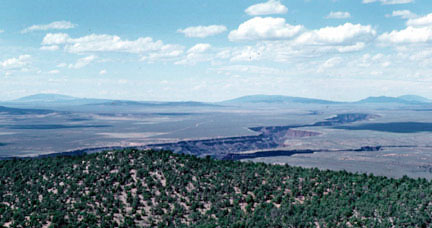 Vista of the Rio Grande Gorge carved through the Taos Plateau with volcanoes in the distance. View to the north from just SW of Taos, NM. The morning after each of the four field exercises, each group of astronauts was shown preliminary results of their gravity traverse. They then discussed interpretations and implications of the results, and participated in the planning of the next groups' traverse. However, none of the teams had an opportunity to view all the data and look at the big picture. In order for the astronauts to completely appreciate the relevance of their efforts, and to prepare them to make their own presentations of the project, we have produced this illustrated report that integrates the processed gravity data with the geologic model. The report is also produced as an interactive webpage with links to PDF files, as a CD-ROM, and as presentation materials. These materials will provide semi-technical geologic, hydrogeologic, and geophysical background information for the Astronaut candidates. The presentation materials will provide the multimedia resources required for the Astronaut candidates and other personnel of the Astronaut Training Office to make professional-quality presentations to colleagues, school groups, members of the public, etc. We hope to also publish the results of the project in a professional journal (NM Geology), professional proceedings (NM Geological Society Meeting), and educational forums (Lite Geology, NM Tech Research Notes, etc.). Such exposure will help to inform the public of NASA's commitment to planetary exploration, and help build the culture of human exploration of our solar system.